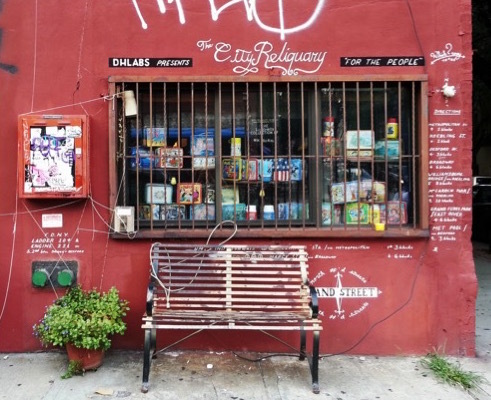 The City Reliquary is a not-for-profit community museum and civic organization located in Williamsburgh, Brooklyn. Through permanent displays of New York City artifacts, rotating exhibits of community collections, and annual cultural events, The City Reliquary connects visitors to both the past and present of New York. The museum began in 2002 as a window display in founder Dave Herman’s Williamsburgh apartment on the corner of Havemeyer and Grand Streets. Passersby who paused to admire the window’s contents would discover a small button on the building’s exterior. With a push of the button, a recording of Dave’s voice would guide them around the display: two-and-a-half links of a “city hall window chain,” a set of dentures found in Dead Horse Bay, Statue of Liberty figurines. On the building’s exterior, Dave carefully painted directions to nearby landmarks and subways. Orienting yourself toward the Williamsburg Bridge, which the directions note is 1.3 miles west, you face the heart of New York City. In January 2006, The City Reliquary moved to 370 Metropolitan Avenue, a storefront only a few blocks from its original location. 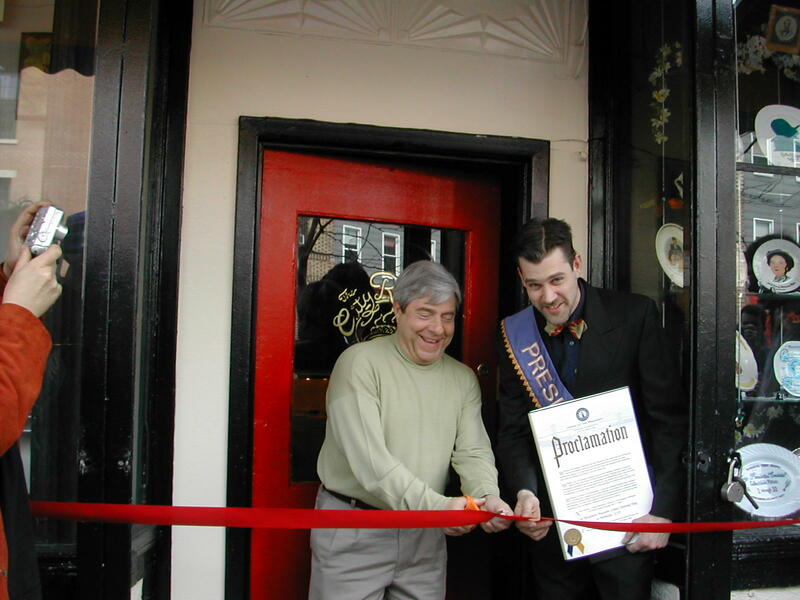 Its grand opening on April 1, 2006 featured a ribbon cutting by Marty Markowitz, who at the time was Brooklyn Borough President. The museum’s permanent collection includes Statue of Liberty postcards, terracotta fragments of landmark buildings, subway tokens, geological core samples, paint chips from the L train platform, a “very old shovel,” and countless other artifacts that tell unique stories of New York City’s past. Rotating exhibitions of community collections celebrate the archival work of New York collectors, and temporary exhibitions showcase vital, yet often overlooked stories of the city. Every year, generous donations from patrons like you help us to continue developing our collections. As the museum grows, so does its programming. The City Reliquary hosts block parties, backyard concerts, and film screenings throughout the year. Major annual events include Collector’s Night, Bike Fetish Day, the Havemeyer Sugar Sweets Festival, and the Panorama Challenge hosted at the Queens Museum.